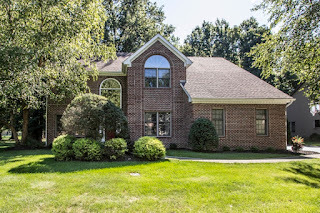 DeLena Ciamacco: The Real Estate Expert: OPEN HOUSE IN SHELLBARK RIDGE! Two-story, wood Foyer. 1st floor Den/5th Bedroom with closet and full Bath access (perfect for In-Law Suite). Fully applianced Kitchen has new appliances, hardwood floors, walk-in pantry and doors to a paver patio. Two-story Great Room has new carpet, dry bar and back staircase to the Upper Level. Vaulted Master Suite has plant ledge, walk-in closet and whirlpool Bath. Finished Basement has new carpet and two Recreation Areas. Many upgrades throughout. 4 BRs and 4 Baths. Over 3,700 SF! Westerville Schools. Only $414,900! Call DeLena today!